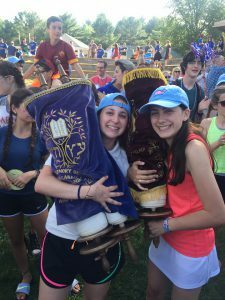 The campers arrived on Wednesday during a crazy hullabaloo of rain, fun, and ruach. As we helped move the campers bags to their bunks and helped them get settled, all was well. Thursday was filled with meetings, planning, and chofesh. That night we had our first peulah with our chanichim and got to know them before our night with them Motzei Shabbat (Saturday night). Afterwards we had our first Kerem BBQ (many hotdogs were eaten). Friday, we had the pleasure of meeting the Sofer (Scribe) who was visiting camp, and helped in the finishing touches of constructing a Torah in Debbie’s honor. Before we knew it, it was Shabbat! We led spirited zmirot for all of camp. Shabbat was magical as always, filled with Shabbos walks, talks, mentors, and playing Cador T. That night we all covered our respective bunks. After, we came back together and shared our experiences from the night. Sunday was D-day! (Debbie Day ;)) We spent the morning shucking corn, putting up streamers, and filling napkin dispensers. After lunch we set up our booths and had lots of fun meeting past alumni and parents. Late in the afternoon, after the parade, we had a small concert led by alumni and the Sussman fam. Kerem led the camp in epic, heated dance battles featuring chanichim, madrichim, and roshei aydah. After the concert we danced with the new Yavneh sefer Torah in true Yavneh style. After an awesome BBQ dinner we all watched possibly the best fireworks in New Hampshire. Today, July 4th, we woke up early and went to Demons (local country store) to witness the reading of the Declaration of Independence and join in for many great songs (Feldman even got the group’s CD). Russo’s shirt was pooped on and we all had a great time. Later today we will have the normal 4th of July ceremonies and are very excited.